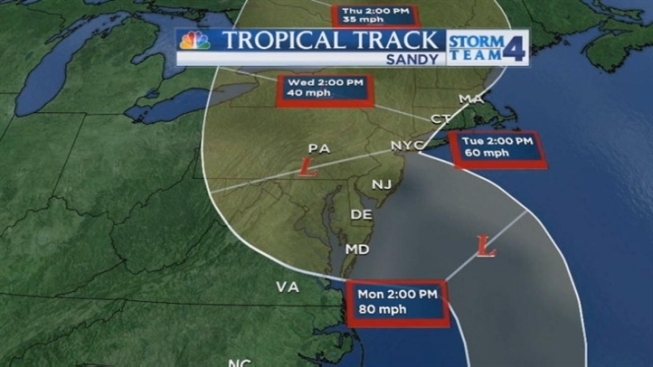 Sandy barreled north from the Caribbean on Saturday, expected to make landfall early Tuesday near the southern New Jersey coast before it hits two winter weather systems as it moves inland, creating a hybrid superstorm that has the potential to cause widespread flooding and lasting power outages. MTA officials warned that subways, bridges and commuter rails could be shut down starting 7 p.m. Sunday, but said a decision would not be made until hours before that. Governors in New York, New Jersey and Connecticut all declared states of emergency, and evacuations have begun in all three states. New Jersey Gov. Chris Christie ordered mandatory evacuations by Sunday at 4 p.m. for the state's barrier islands from Long Beach Island south to Cape May. During a briefing Saturday, he also ordered evacuations at Atlantic City casinos by that time. Steve Villanueva's evening forecast for Saturday, October 27. To anyone planning to ignore the warnings, Christie said: "Please don't. We have to be prepared for the worst here." 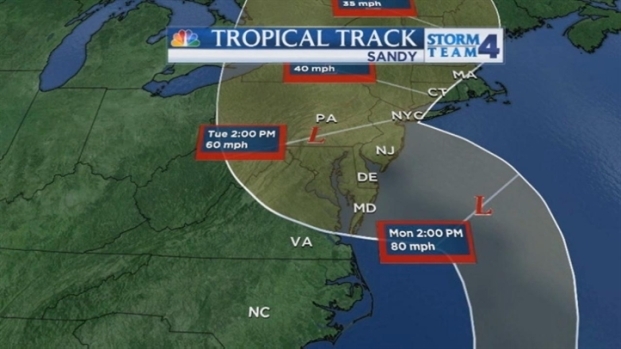 Storm Team 4 Meteorologist Raphael Miranda's update on Hurricane Sandy's path and its potential to bring damaging winds and rain to the tri-state area. Sandy, which has left more than 40 people dead in its path, is moving parallel to the southeast coast of the U.S. through the weekend. The storm could be wider and stronger than Irene, which caused more than $15 billion total in damage, and could rival the worst East Coast storm on record. On Saturday morning, forecasters said hurricane-force winds of 75 mph could be felt 100 miles away from the storm's center. After Irene left millions without power, utilities in the tri-state were taking no chances and were lining up extra crews and tree-trimmers. Wind threatened to topple power lines, and trees that still have leaves could be weighed down by snow and fall over if the weight becomes too much. Sandy was briefly downgraded on Saturday to a tropical storm, which is defined by only a small difference in wind speed; a hurricane has sustained winds of at least 74 mph while a tropical storm has 73 mph and under. More fluctuations between hurricane and tropical storm status are expected as it heads north. The rain bands of Sandy will first show in the tri-state region on Sunday, with the heaviest rain developing Sunday evening and lasting through Tuesday, meteorologists say. The worst of the system is expected to hit Monday into Tuesday morning. Sandy is likely to arrive in our region during a full moon when tides are near their highest, increasing coastal flooding potential, particularly across the south shores of Long Island and coastal New Jersey. Significant beach erosion is expected along the shore lines with wind gusts of 60 to 70 mph, 6 to 10 inches of rain, waves of up to 20 feet and widespread power outages that, with some trees still leafy and the potential for snow, could last to Election Day. Under the heaviest rain band, which looks like it will settle across New Jersey, rain totals could exceed 10 inches, saturating the ground. As strong winds move across those soaked soils, that could cause trees to come down, causing large-scale power outages. The first evacuations in New York have been ordered on Fire Island. Residents are to leave by 2 p.m. Sunday, the Islip town supervisor said. Mayor Bloomberg said late Saturday that the city was not yet ordering evacuations for low-lying areas, which include Battery Park City, Coney Island, Manhattan Beach, Far Rockaway and Midland Beach and South Beach in Staten Island. See the zone in orange on this map. He said New Yorkers in those areas should still expect some flooding and loss of power. The city is opening shelters in 65 public schools on Sunday for residents who are concerned that their homes in flood-prone areas will be affected. City parks would close at 5 p.m. Sunday, the mayor said. 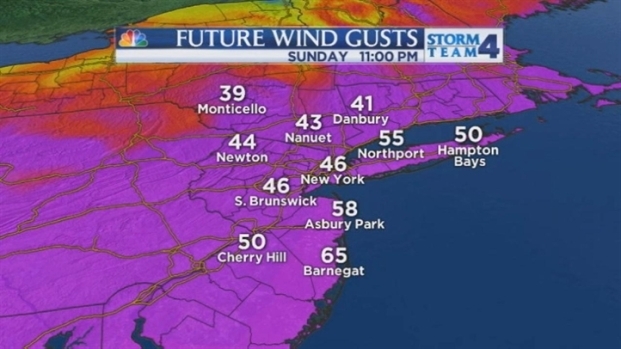 The MTA says its plan calls for service to be shut down if sustained winds of 39 mph or higher are expected. Ahead of the storm, extra workers were being called in, trains were being removed from outdoor yards and subway ventilation grates vulnerable to flooding were being sandbagged and covered. The agency says some vehicles may be barred from its bridges when winds reach 50 mph or more, and the bridges could be closed if winds reach 60 mph. Bloomberg said officials would decide Sunday if school would be in session on Monday. Gov. Andrew Cuomo is urging people to prepare storm kits, which include non-perishable food, water, cash, filled prescriptions, a battery-powered or hand-crank radio, first aid kit, flashlights and batteries. "We want to take every precaution possible," Cuomo said. In Suffolk County, officials are telling residents to leave flood-prone areas. Several shelters have been established; the latest information can be found here. In Nassau, residents can go here for information. Officials say shelters will be set up in 18 counties to accommodate roughly 12,000 people and, if needed, the state will mobilize five shelters to house another 5,000 people. For a list of county OEM coordinators, go here. Despite the dire predictions, some coastal residents said they planned to stay in their homes. Many predicted Sandy would fizzle as most of the recent storms to approach the shore did, while others said they felt safer in their homes. Many residents, though, were preparing for the worst. One island resident who wasn't taking any chances was Russ Linke. He and his wife planned to leave Ship Bottom after securing their patio furniture and packing bicycles into their pickup truck. "I've been here since 1997, and I never even put my barbecue grill away during a storm," Linke said. "But I am taking this one seriously. They say it might hit here. That's about as serious as it can get." PSE&G is warning that between 500,000 and 1 million of its 2.2 million customers could lose power. The Department of Environmental Protection is opening the Pompton Lakes Dam to lower the lake's level in advance of the storm. The town of Pompton Lakes sits between the Pequannock and Ramapo rivers and has a long history of flooding. In addition, the state is lowering the levels of four reservoirs used for drinking water in northern New Jersey for the first time ever in preparation for the storm. According to Larry Ragones, a spokesman for the department, the actions were being taken to "create a void space for runoff from the storm." Several Connecticut shoreline municipalities are calling for evacuations of low-lying areas. Bridgeport and Fairfield are issuing evacuation orders for vulnerable communities effective as of noon Sunday. Old Saybrook and East Haven are also calling for people to leave flood-prone areas. Gov. Dannel Malloy says Connecticut residents should expect to go for a long time without power. Malloy said on Saturday that the extraordinarily long storm could hamper recovery efforts in a state used for severe weather that generally lasts for 12 hours. "Folks, this could be bad, really bad. It could impact us in several ways and for a long period of time," Malloy said. "Please take it seriously as we are taking it. We are talking about a potential for high number of power outages and for an extended period of time. We are talking about severe flooding." Malloy spoke hours after he declared a state of emergency ahead of the storm. He says 400 members of the national guard will be on standby to help in recovery efforts. Other preparatory measures include putting additional state police troopers and dispatchers on duty. 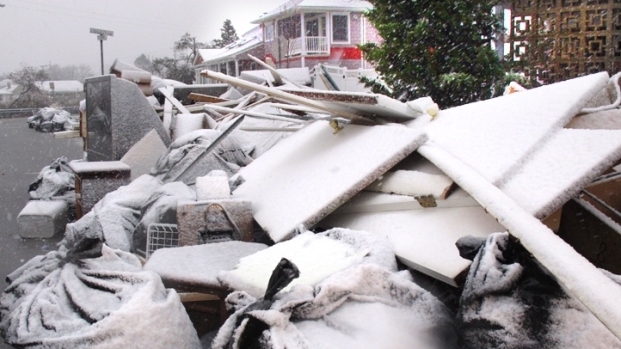 The state has launched a site to keep residents up to date on Sandy. It can be found at www.ct.gov/sandy.